Magnesium is one of the key minerals for regeneration; it is used in over 350 enzymatic reactions in the body, more than any other mineral. Next to Oxygen & Iodine, Magnesium is the third most important element for sustaining life as well as reversing disease and aging. It can take a year or more with conventional magnesium supplements to resolve the long term magnesium deficiency we almost universally, suffer from. With Mag Sea Pure - ancient ocean seabed magnesium chloride, the deficiency can be resolved in a few months. 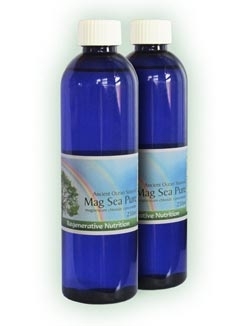 Mag Sea Pure can provide therapeutic benefits in almost every health condition. Transdermal application is considered the best route. Please see the article Ionic Liquid Minerals and also Celtic Sea Salt to understand the benefits of whole, unheated, unrefined sodium chloride as opposed to the denatured heated refined sodium chloride that is widely added to our food. The magnesium chloride in the above product occurs naturally as a result of geological processes concentrating the magnesium content and associated trace elements from an ancient ocean source. It is obtained from a deep mine and filtered and cleaned for nutritional use. Magnesium is the calming mineral for relaxing muscles, relaxing arteries and calming nerves, whereas Calcium contracts muscles. Nutritionist Thomas Steinmetz found that Magnesium deficiency is the cause of death from sudden heart attacks in 8 million people in the U.S. from 1940-1994. Magnesium is rapidly used by the adrenal glands in times of stress. Magnesium maintains proper electrical potential (voltage) across nerve and muscle membrane and increases white blood cells ability to fight infection by 300%. The body does not hold onto Magnesium like it does Calcium. Magnesium is excreted as a result of high stress, sugar intake, alcohol, caffeine, diarrhea, high protein diets and fruits. When it comes to healing and life itself, after the water we drink and the air we breathe, magnesium lives up to it's billing as the miracle mineral that can save us in our time of desperate need. Called "the beautiful mineral" by the ancient Chinese, its beauty is seen in the absolute healing power it contains. It is nothing short of a miracle mineral. It holds the key for hundreds of crucial enzyme reactions and cellular processes. Magnesium Chloride, when supplied in sufficient quantities, can kick start cell physiology in a very powerful way. Magnesium Chloride is the ultimate in preventive supplementation as well as an all purpose remedy used to treat more clinical situations than any other single therapeutic agent. There is no substitute for Magnesium; it's as close as a metal comes to being as necessary as air. Mag Sea Pure is applied via the skin (transdermal application). Typical use for a fairly intensive restoration of the bodies magnesium status is around 12 ml daily. This amount can easily be massaged into the skin using the palm of the hand. Protein synthesis: DNA and RNA in our cells require magnesium for cell growth and development. Sparking the electrical signals that must travel through the nerves in our bodies (including the impulses for brain, heart and lung function). Energy regulation and distribution throughout the body. Normal blood pressure, vascular tone, transmission of nerve-cell signals, and blood flow. As Magnesium is fundamental to virtually all metabolic processes in can help restore health in almost any health disorder and has been used as a corner stone in systemic mineral and vitamin therapy to this effect since the 1980's. Magnesium Chloride should provide benefits to people with any of the disorders listed below, but also has wide ranging benefits for general good health. It can take a year or more with conventional magnesium supplements to resolve the long term magnesium deficiency we almost universally, suffer from (Studies indicate that an estimated 80% of "western" populations are Magnesium deficient) . With Mag Sea Pure - Ancient Ocean Seabed Magnesium Chloride applied to the skin, the deficiency can be resolved in a few months. This dramatically increases your chances of significant health benefits and underpins any other therapeutic input. This is because the minerals act as a foundation (as the base of the pyramid so to speak). A foundation upon which to build good health. Without this foundation we are not able to integrate other therapies/supplements so well and can over stimulate or react poorly to life's health challenges, such as stress or pollution. Of all the minerals, Magnesium is the most widely deficient. We can consider it the most basic, yet potent, step in health recovery / improvement. Magnesium Chloride is paradoxically both calming and energising. Long term use will tend to aid sleep, but in the short term the energising effects on sensitive people, especially if used in the afternoon or evening, can possibly cause restlessness or difficulty getting to sleep.